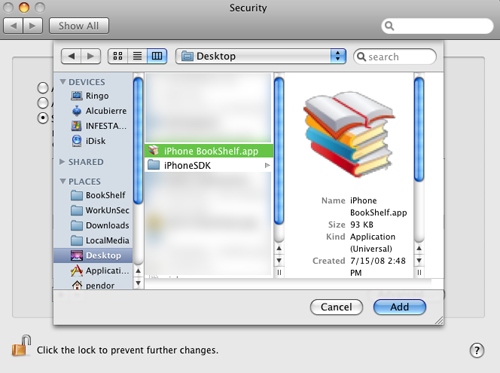 If you haven't already, you can install Tomes from the AppStore on your iThing or through iTunes on your desktop. Click here to open Tomes's page in iTunes. If you've just installed Tomes on your device, odds are the first thing you'll want to do is put some books on it. 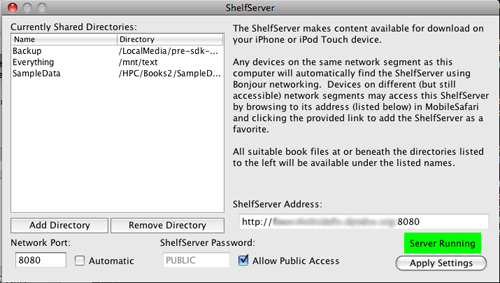 You can load books onto your device using the ShelfServer application which runs on Mac OS X, Linux and Windows. The easiest way to get ShelfServer running is to click on the "Launch ShelfServer" link to start the application using Java WebStart. For most users, ShelfServer will JustWork™, so try the Run ShelfServer link before worrying about the system requirements. If it does work, you can skip down to Using ShelfServer. Note that if ShelfServer warns about not finding the Bonjour networking libraries, Windows users may need to reinstall Bonjour manually. You may also optionally type a different, more descriptive name in the box on the left side. This name is what will be shown on your device when you connect to your ShelfServer. 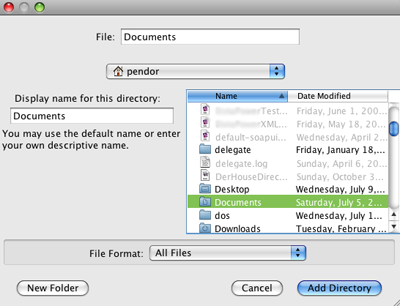 Once you've selected a directory and entered a name (if desired), click "Add Directory" to save your choice. Your selection should now appear in the Currently Shared Directories list. You may add as many directories as you like. Once you've added all of your directories, you may wish to set a password for your ShelfServer. Not unlike setting a password on your shared iTunes library, the ShelfServer password prevents others from accessing your content. If you're on an open WiFi connection, you should definitely set a password to prevent possible copyright infringement of the books stored on your server. On the other hand, if all of the content on your Shelf is either freely shareable or the copyright is owned by you, leaving the "Allow Public Access" box checked will allow anyone connected to your WiFi network to retrieve your content on their device. Once ShelfServer is running, you can use your device to download content. Assuming your desktop and device are on the same WiFi segment and that Bonjour networking is active, your device should find your shelf server automatically. You may need to tap the "Rescan" button to get Tomes to find your server. Once detected, you may see a "red key" icon which indicates a password is necessary to access the Shelf. Tap the red key and enter your password, at which point the key should turn green. Note that public Shelves (those with no passwords) won't show any key icon at all. 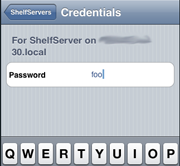 Once any required password is entered, you can access a ShelfServer's content by tapping its row in the table. You'll be shown a list of each of your shared directories. Tapping a directory shows its contents, and tapping a book file will download the file to your device. Entire trees of files can be downloaded by tapping the "Download entire folder" option inside that directory. When files are downloaded (whether one at a time or by the entire tree), any directory information relative to the top shared directory is maintained. You can exit the shelf and return to your newly downloaded books at any time by clicking the Done button on the toolbar. Now that you have some books on your device, you should check out Using Tomes to learn about Tomes's reading interface. If you use a software firewall (either O/S provided or third party), you may need to reconfigure it to allow ShelfServer connections to come into your computer. The following instructions explain how to reconfigure the firewall that's included in Mac OS X 10.5 (Leopard). 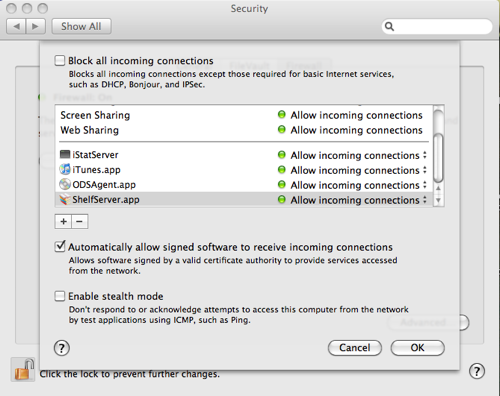 The firewall configuration screen can be found in System Preferences, in the Security applet under the Firewall tab. ShelfServer will work fine if the firewall is stopped completely. If the firewall must be enabled, click the Advanced... button to show additional settings. Click the '+' button and browse for the ShelfServer application inside the /Applications/ folder, and click OK to apply settings. ShelfServer will work in one of two configurations. If "Allow all incoming connections" is selected, then the firewall is completely disabled. ShelfServer should work fine in this configuration. Alternatively, if the firewall must be left on, then "Set access for specific services and applications" must be selected. The "iPhone Tomes.app" application must then be added to the list by clicking the "+" button below the list and selecting the app. By default, the icon is created on the user's desktop. Once the app is selected, click Add, and the application should appear in the list of allowed applications. 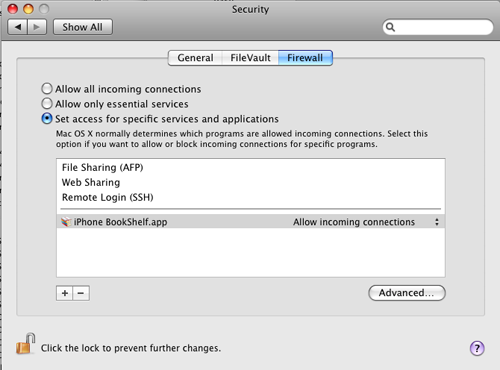 Close System Preferences, and ShelfServer should now be visible to your iThing while the firewall remains active for other applications. 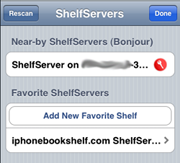 In addition to the Bonjour based auto-detection of ShelfServer's, Tomes also allows you to manually add Shelves from the Internet or local network. To add a Shelf, click the "Add New Favorite Shelf" row under Favorite ShelfServers. The row will change to a text entry box. Tap in the box to show the keyboard, then enter the name or IP address and the port of the ShelfServer like 123.45.67.89:8000 or iphonebookshelf.com:8080. When you tap the Go button on the keyboard, Tomes will connect to the server to verify the URL. If the connection succeeds, the server will appear in your favorites list, possibly with a "red key" icon if a password is required. Manually added Shelves can be removed from the list using the "swipe to delete" gesture. Tomes handles the "shelfserver:" URL scheme for links followed in Safari. If you tap on such a link (there's one on the right side of the iphonebookshelf.com home page), the link will automatically open in Tomes and add the shelf to your favorites list. You can then tap to set a password if necessary and connect to the shelf to download content.